From Castelluccio di Norcia to Nursia, through San Pietro in Valle and Ferentillo, Valnerina is a territory rich in art, history, wildlife, traditions and gastronomy. We end our trip on the traces of the ancient via Flaminia, the Roman road built in 220 BC to connect Rome with the Adriatic Sea. The Mounts Sibillini and Castelluccio di Norcia. Mounts Sibillini are a wildlife area of more than 15 thousand acres. Its highest peak, Mount Vettore, rises up to 9000 feet and hosts the Lake of Pilato, a small, “eyeglasses”-shaped glacial pond. On its Umbrian side, it gently slopes down to three plateaus: Pian Grande, Pian Piccolo and Pian Perduto. Castelluccio di Norcia, the highest village in the Apennines (4764 feet above sea level), offers a breathtaking sight on Pian Grande. Between the end of May and the beginning of June, the plateau turns into a multicolored patchwork of flowers: poppies, narcisses, gentians, tulips, cornflowers, and the yellow and blueish hues of lentils. Norcia e Cascia. A scenic road leads us from Castelluccio to Nursia (SP 477 and SS 685), birthplace of Saint Benedict, and also famous for its production of salami. From Porta Romana, one of Nursia’s eight gates, we walk through groceries and food shops, until we get to Piazza San Benedetto, one of Umbria’s most fascinating squares, with the Palazzo Comunale, the Loggia dei Mercanti, the Basilica of Saint Benedict (built directly upon the Saint’s birthplace), the Cathedral and the monumental Rocca Castellina. 12 miles from Nursia (SS 685 towards Serravalle, SR 320 towards Sant’Anatolia), Cascia owes its notoriety to a saint, Rita (1381-1457), whose temple, built in 1947, with an interesting altar by Giacomo Manzù, is the only reason for visiting the town. San Pietro in Valle, Piediluco. We continue are trip across Valnerina (SS 685 towards Cerreto di Spoleto, SR 209 towards Vallo di Nera), and reach San Pietro in Valle. According to the tradition, this abbey was erected on the site of an ancient hermitage, founded by Syrian monks; more probably, it responded to the need of controlling a crucial crossroad between Rome and Ravenna. Three cloisters give access to the church (XI-XII century), decorated by a cycle of frescoes, counted among the most important of Umbria’s Middle Ages. Moving towards Terni, we come across many pictoresque towns: the twinned Arrone and Casteldilago, Collestatte, Torre Orsina, Montefranco, and Ferentillo, notable for its museum exposing a series of naturally mummified ancient bodies. Few more than 6 miles from Terni, the Lake of Piediluco deserves a visit, together with the town of the same name, with its many scenic viewpoints. Marmore's Falls, Carsulae. “A matchless cataract / horribly beautiful! But on the verge / from side to side, beneath the glittering morn, / and Iris sits, amidst the infernal surge”: so Lord Byron, in his “Childe Harold’s Pilgrimage”, described Marmore’s Falls, included among the stopovers of the Grand Tour. The waterfall was created in 271 BC by the roman Consul Marcus Furius Dentatus, in order to drain the plain besides Rieti from the swampy waters of River Velino, and still stands as a powerful and impressive view, with its 272 feet. Near Cesi, the vast archaeological site of Carsulae hosts the ruins of a Roman town, along the ancient Via Flaminia. Many buildings are still partially standing, including some tombs and temples, the thermae and the amphitheatre. San Gemini, Narni and Amelia. Around Terni, several towns have preserved their Medieval charms, with castles, fortresses and wildlife areas. 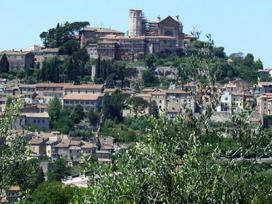 San Gemini, famous for its mineral springs, has also a beautiful historic center. Narni has an imposing fortress (Rocca) and hides an underground side, with Roman cisterns, a church and the Inquisition’s dungeons. Nearby, the ruined Augustus’s Bridge, crossing river Nera, and the abbey of San Cassiano. A 10 miles’ trip leads us to Amelia (SS 205 along strada Amerina, Via Roma, Fornole), one of the most ancient human settlements in Umbria. Its center is a maze of alleys and squares, with countless places of artistic and histocal interest. The Archeological Museum preserves a statue of Germanicus. We end our journey visiting the “Sacro Speco” (Holy Cave), 8 miles from Narni (towards strada Narni - Sant’Urbano), dedicated to Saint Francis, who dwelled here in 1213.